Italian sausage as part of a smart eating plan? You bet. Pasta, tomatoes, fresh spinach plus melty cheese presents old-world flavor in a new-world dish. Cook pasta in large saucepan as directed on package, omitting salt. Meanwhile, cook sausage in deep large skillet on medium-high heat 10 to 12 minutes or until done, stirring occasionally. Drain; return sausage to skillet. Add spinach and tomatoes; cook 2 minutes or until spinach is wilted, stirring occasionally. Drain pasta; return to pan. Add sausage mixture and cheeses; mix lightly. Serve with a crisp mixed green salad tossed with KRAFT Tuscan House Italian Dressing to round out the meal. 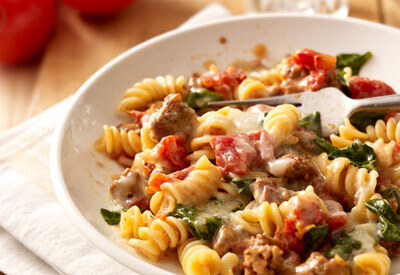 Substitute ground beef or turkey for the Italian sausage. Available on Jumbo Pack, S1-6, 23-50 ct. pkg.